Luxury watches nowadays are becoming increasingly replicated. Counterfeiters are replicating the watches with high quality, making them impossible to recognize, even for the own brand. Regardless of the high quality of fake watches nowadays, there still some ways to identify a fake watch. In Chronosky, our team expertise and machines helps us identify the originality of a watch. 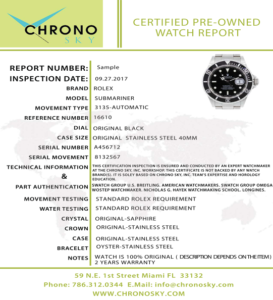 We made certifications of inspection that are ensured and conducted by an expert watchmaker at the Chrono Sky, Inc workshop. This certificate is not backed by any watch brands. It is solely based on Chrono Sky, Inc team’s expertise and horology education. Our exceptional knowledge comes from the best watchmaking schools and programs of the world such as Swatch Group U.S, Breathing, American Watchmakers, Swatch Group Omega, Wostep, Nicholas G Hayek & Longines. For more information regarding our certification and features, please contact us.